As an estate planning attorney, I’m often asked how to obtain a copy of a deceased person's last will and testament. My short answer: Since probate records are public court records, a will that’s been filed for probate should be easily obtainable—especially with an assist from modern technology, which can help you locate a deceased person's estate online—usually for free. However, some courts have begun charging people to view probate documents. But at the very least, you can view a list of the filed documents along with other essential information. The name of the executor of the estate. The attorney the executor has hired. In some cases, the name of all of the beneficiaries of the estate. The above information will enable you to request copies of the will from the probate clerk's office or contact the executor or the executor's attorney for additional information. An estate is probated in the county where the deceased person lived at the time of his or her death, or in some cases the county in which the deceased person owned real estate. Click: City - County Search to locate the correct name of the county by plugging in the name of the city where the deceased person either lived or owned real estate. Appear in person and ask for a copy of the will, or make a written request by fax or mail. Pay a copying fee for the number of pages the probate document contains (typically around $1 per page). Provide a self-addressed, stamped envelope for mailing the copies if the request is not made in person. Visit the Records section on the Broward.org website. Click on "Document Type" and scroll down until you see "Probate." Click on the case number. You can request to view an entire probate file in person by filling out a Court Records Request Form at the Broward clerk's website. If you are unable to appear in person to view the file, contact the probate department of the Broward County clerk's office at (954) 831-4000 to determine the process for obtaining copies. 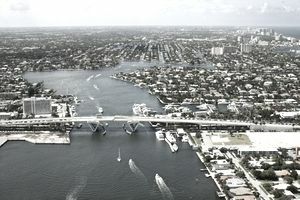 Other cities located in Broward County include Coconut Creek, Cooper City, Coral Springs, Dania Beach, Davie, Deerfield Beach, Hallandale Beach, Hillsboro Beach, Hollywood, Lauderdale Lakes, Lauderdale-by-the-Sea, Lauderhill, Lighthouse Point, Margate, Miramar, Plantation, Pompano Beach, Port Everglades, Southwest Ranches, Sunrise, Tamarac, and Weston. If the decedent resided in or owned property in one of these cities, contact the Broward County clerk's office as indicated above. If you wish to view a copy of the last will and testament of Anna Nicole Smith (a.k.a Vickie Lynn Marshall, Vickie Lynn Smith, and Vickie Lynn Hogan), which was filed in Broward County shortly after her death at the Seminole Hard Rock Hotel & Casino in Hollywood, Florida, refer to the last will and testament of Anna Nicole Smith.